Interpreting happens whenever two people or two groups of people do not share a common language but need to or want to communicate with each other in order to conduct business or share information and ideas. 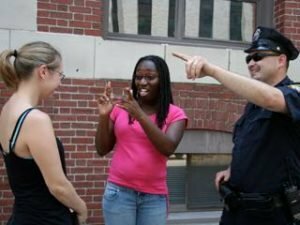 When people who are Deaf (and who use sign language) and people who are not Deaf (and who use a spoken language) want or need to talk to one another, that’s when interpreters do their work. Interpreters must understand the meanings and intentions expressed in one language (the source language) and then express those meanings and intentions in the other language (the target language). In order to do this, interpreters have to have a high level of fluency in each language. Most of the time interpreters work simultaneously, which means expressing what someone just said while at the same time focusing on what someone is saying right now. Sometimes interpreters work consecutively, which means listening until someone has completed an idea and then interpreting that idea. Interpreters also have to follow a professional Code of Conduct; one of its most important tenets is to maintain confidentiality. This means keeping private whatever happens in the interactions that are interpreted. Interpreting is a very challenging and rewarding career especially for those who enjoy the way languages work, enjoy the way that people use language to get things done and enjoy playing an important role in helping people interact with each other. In the Boston area the local interpreter referral agency cannot keep up with the increasing number of requests. Even though there are interpreters graduating and entering the field, the number of requests keeps increasing and there are not enough interpreters to meet the demand. The highest fill rate I’ve heard of is about 80%. My mom was being placed in a sort of nursing home and we’d requested an interpreter for a meeting on her first day there. It was important to get clear on her needs, medications, and expectations about everyone’s role in her care. In spite of the terribly stormy day, everyone managed to show up – the doctors, social workers, everyone….except the interpreter. It was so frustrating trying to follow what everyone was saying. Even with my brother trying to help out, I still missed so much of this important decision-making process concerning my own mom. Interpreting is an exciting career! We get to work with a wide variety of people of all ages, in a myriad of settings and situations. The demand for interpreters always seems to outweigh the supply, so we can always find work. 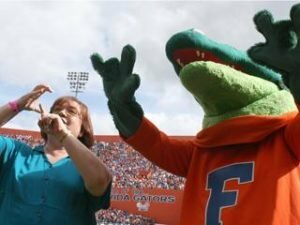 Technology is offering new possibilities for the Deaf community and interpreters all of the time. For example, what once required a trip to the pizza parlour to order and pick up a pizza, simply requires a call to the Video Relay Service where an interpreter is waiting to take the video call and interpret the order. The pizza can be delivered! It’s interesting in our area because being Orlando interpreting where there are mice and there are whales among other critters running around, we have an incredible diversity of work that other places may not have. For example, Orlando really competes with Las Vegas to be a number one convention spot. Sometimes they’re number one; sometimes we’re number one. The number of conventions that come is unbelievable. So we do convention work, we do K-12. We do, for example, yes, there’s performing arts say in Washington, D.C. but we do performing arts every single day. So we really get to hone that craft. So we have a very unusual situation that for our job market, we need everything including those people who can speak Spanish or Creole in addition and the signing languages. People come from all over the world to Orlando. And, so, as a result, ours is very diverse, very varied demand for services. Our job market is very wide unlike another area that has more work in the technical end or government agency type of work. We’ve got it across the board. American Sign Language (ASL) is spoken by many Deaf and hard of hearing people in the United States and Canada. It is a complete language with its own grammar and syntax. It is not merely pantomime nor is it English using the hands. It is not universal. Interpreters use American Sign Language and spoken English to communicate. Interpreting refers to the transfer of communication between languages, while maintaining each speaker’s intent. 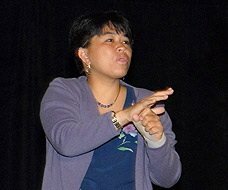 Individuals who are Deaf or hard of hearing use ASL in many situations where verbal language is difficult to understand such as lectures, theatrical shows and conferences. Probably what I enjoy the most is concert interpreting. My first major in college was vocal performance and I’ve always tried to figure out how to marry my two loves. Being able to interpret concerts is one way I can do that. Whether it’s someone who wants beautiful ASL interpreting and I can do text analysis on songs I enjoy or if the person is hard of hearing and copy signs or sings along with the chorus, it is a fabulous feeling. I love it. It is one of the most rewarding, enjoyable, and fun things I can ever do! The first quality an interpreter needs would be intelligence. We go into a lot of different situations and we need to know a lot of information. Another quality is compassion. You go into a lot of situations where people need your services and feeling good about giving those services is important and understanding the need for them. Third, love. Love the work. The work, the job we do is the coolest job in the world. When I tell people what I do, they say, “Oh, that’s so cool!” I say, “Yes, it really is!” It’s a wonderful job. It might be hard, it might not always be fun, but it is always a wonderful job. Interpreting can take you anywhere. Anywhere people need to communicate is where my job takes me. How do I choose from the more than 130 interpreting programs across the U.S.? The employment, or size, of this occupation in 2014, which is the base year of the 2014-24 employment projections. At U.S. degree-granting colleges and universities, enrollment in courses of languages other than English reached nearly 1.6 million in fall 2013—a 12-percent increase over fall 2002. I hope that someone who sees my work as an interpreter will think, “Hey! I can be a linguist,” “I can be an interpreter for a top scientist.” “Or I can work with blue-collar people and it’s all honorable work.” This is the kind of work that honors our ancestors who came here to this country and were hotel janitors or people who made up the beds, or who worked as stevedores. My work honors their work. Regardless of the fact that I’m not an engineer. I often say to my father, thank heavens I’m not an engineer. I, as an interpreter, honor my ancestors. I, as an interpreter, honor my people. Come join us, please! The old Army saying, “Be all that you can be,” that really fits with interpreting. Now is a great time to become an interpreter. There is a lot of need out there for interpreters. Now is a wonderful time to come join us. Support of ritetemp thermostat 8022c. Currently, most of my work now for the past 2+ years is Video Relay. And I do trilingual interpreting, so I work with English, Spanish, and American Sign Language. In most of my work, I get exposed to a lot of the Latin American countries, the Spanish-speaking countries. And one of the first times I was exposed to it, it was very challenging: the accent, the Spanish mannerisms, the Spanish colloquialisms, the Spanish regionalisms… it was overwhelming! But with time, and with a little study, and with a little dialogue among my colleagues, we were able to elevate our knowledge, our understanding, of what’s going on in those countries. Like geography, I had no knowledge of Puerto Rico before. Now I have some idea where the cities are, learned some of the city names or how they pronounce their words, and I’m able to work with that. So most of my work is in the trilingual environment. I do work some freelance, and that could be anything. It’s just a wide gamut of jobs…except for the legal arena. I respect those that are able to do a better job. I will fill in when I can, but it’s a much more challenging environment for me to be in so I kind of stay away from it. The one thing that everybody always says is to be very flexible. You just never know what you’re going to get day-to-day, even if you work in the same place every day, you still never know. And you’re going to have to work in environments that make it difficult. Or they tell you you’re doing something, and then you go there and find out it’s something completely different. You just really never know! So you just have to go into a situation with an open mind and be willing to do what needs to be done to make the communication happen as well as possible. This Discover Interpreting! 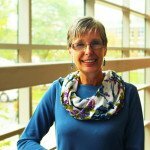 Facebook group began as a part of a federally-funded grant, coordinated by the National Consortium of Interpreter Education Centers. 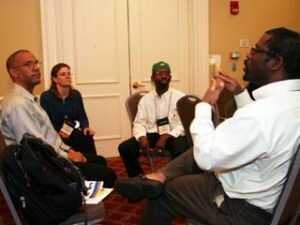 This Facebook group began in 2008 and it is a resource for people to post questions, relevant articles and news stories, and also refers folks to the DiscoverInterpreting.com site for more info on beginning a career in interpreting. The goal is provide education, resources, and support and the Discover Interpreting! initiative is meant to help guide folks who are interested in pursuing a career in interpreting. People visit the Facebook site for all different reasons, from all different places, at all different ages and stages of life. 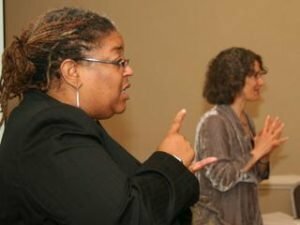 The group consists of a mix of Deaf and hearing people who want to learn more about interpreting as a career, or who are already professionals affiliated with sign language. The composition of contributors on the Facebook group are as diverse as field so opinions and responses certainly do vary. We ask that posters assume good intent and be respectful and supportive of others in submitting comments to posts.